I've just bought a Sensa Umbria Tiagra Special. As you can imagine, I’m very excited. I love the Purple Peril, but it has put in 16 years of dependable service and it just isn't holding up very well anymore. I'm pretty sure the frame itself could put in another 16 years if need be, but everything else is old enough to require replacement or time consuming maintenance after even the shortest of rides. The point at which the bottom bracket started to make a combined grind-creak-click noise with every turn of the pedals made me think it was time for a new bike. These days it would cost me more to replace all the Peril's ruined bits than than the Peril itself cost 16 years ago. I suppose that's inflation for you. Like a lot of people, I’ve had my eye on the Sensa range, and particularly the Sensa Umbria Tiagra Special, since they first popped up on Merlin’s website about five or six months ago. The Sensa range hung around quietly for a while, selling at a discount to riders who were prepared to join a product feedback scheme. The feedback must have been positive, as the range then received a proper fanfare last November by way of announcements in Cycling Weekly and on numerous websites, after which the Umbria Tiagra Special quickly became the “most popular bike we’ve ever had” in the words of one Merlin employee. They sold two others during the forty five minutes I was in the shop. The reason why it took me a while to actually commit to buying one was simple: every time I googled the words “Sensa Umbria Tiagra Review”, I’d get nothing. Sure, there were plenty of cycling forums in which people were asking if they were any good, but precious few people replying who could claim to have ridden one, and not a single professional review. When mine arrives in a fortnight’s time, I’ll be posting a review. I won’t call it a "professional" review, as I’ll own the bike, which is a pretty unprofessional basis to start from. 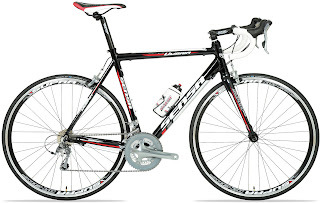 Having been a hardware reviewer for the last twelve years, however, I can promise that it will be a carefully considered opinion, weighed up in comparison to other entry level rides, and assessed using relevant criteria. In the meantime, I can tell you what actually clinched it for me when I finally got my hands on one in the shop. For starters, the price really isn’t too good to be true, which had been my original worry. The first things most people ask when assessing a full bike are: what's it made of, and what group does it have? The Umbria Tiagra is an aluminium frame with a full Tiagra groupset. Given that the next nearest full Tiagra aluminium bikes are the Peugeot CR22 the Trek 1.5, which are a disconcerting £90-150 more expensive, it was easy to wonder why Sensa's offering was so much the cheaper of superficially similar bikes. It turns out there are some pretty clear differences between them. Having ridden both the Trek 1.5 and Sensa Umbria in the last year, it’s clear that the Umbria is heavier. Not a lot heavier, but heavier nonetheless. If you look beyond the two big signposts of frame and groupset, there are also a fair few differences in finishing kit: the 1.5 comes with pedals (not good pedals mind you, but even basic nylon clips-and-straps are two pedals more than the Umbria). The 1.5 is adorned with Bontrager goodies-Trek's own brand, granted, but a name that stands on its own feet, while the Umbria comes with Sensa’s lesser known Supra own-brand components. Then there’s the fork: an all-carbon jobby on the Trek, compared to a carbon blades/alloy steerer combo on the Sensa. So yes, there is a £150 price difference between the Sensa and the next nearest alu/Tiagra ride, but it’s a fairly easily explained difference, not a hint that there’s something underhanded going on. There's also the simple difference that Sensa are a comparatively young and obscure Dutch manufacturer, while people have heard of Trek due to the seven high-profile Tour de France victories they had under Lance Armstrong's cheating, needle-riddled arse. Given the Umbria’s old-school construction (straight lines and big, round alu tubes) it’s unlikely that swapping all its finishing kit for that of the Trek would actually make it as light as the 1.5. It’s also about half a kilo heavier than the similarly priced Specialized Allez with 2300 group. On the other hand, it’s by no means a heavy bike, and it weighs in at about half a kilo less than the other hot entry-level road bike of the last six months (BTwin’s Triban 3). Given that I’m moving from steel to aluminium, it’s all featherlight to me anyway, and I’ll happily take clean good looks over modern sloping tubes and kinked stays. Those last two points are obviously very personal, as is the Umbria Tiagra's big selling point for me: geometry. I’m six foot two, with lanky legs and a long back. I’ve previously ridden a 59cm frame that never seemed to have enough reach. First I bought a raked seatpost, then I ran the saddle to the front of its rails, then I put a longer stem on it. Despite aggregating all these marginal gains, the end result didn’t do much to stop me feeling like I could rest my chest on the bars of my old Peugeot. As soon as I jumped on the Sensa Umbria, I could feel a big difference: my back was sloped rather than curled, and the bars felt much further forward. I’ve loved my purple Peugeot for 16 years, but even with all my tweaking I’m not sure it’s ever been as good a fit as the 58cm Umbria was straight from the box. Obviously an advantageous spec, noticeable weight reduction compared to steel, and a better fit are all very subjective things: if you dislike the idea of having to gradually upgrade house-brand wheels, post, fork etc, or if you’re not making a such a sizeable switch from steel to aluminium, or if you’re not a lolloping beanpole of a rider, then the Umbria Tiagra might not sing to you the way it sings to me. Personally, I can’t wait to take it out onto Clandon Hill, Richmond Park and anything else fun I can ride on round here. Once I’ve got the miles in, I’ll put up an in-depth review. Edit: This post is now far and away the most visited one on the blog, which is nice, but hey, doesn't anyone want to read about Mont Ventoux or the charity ride I'm doing with the Sensa Umbria? Would love to know what you think of the Sensa, thinking of getting one myself. I am trading up from a 20+ year old Specialised with shifters on the down tube, so am expecting a huge improvement! I'm going to write up a detailed review in the next few days, based on some actual miles/climbs/lively surfaces and wind conditions, nut all told, it's lovely. Comfy and nippy, but with the emphasis on nippy.